At Mirage Outdoor Lighting we professionally install outdoor lighting systems, mosquito mist systems, outdoor sound systems, and mist/cooling systems. Our professional installation combined with only the best fixtures and parts insure a quality system that will provide years of enjoyment! We offer many choices to meet your lighting needs including MR-16, Low Voltage, Down Lighting, Tree Lighting, Moon Lighting, Up Lighting, Energy Efficient LED lighting and many more. Contact us today to see how we can help you! Now Installing Energy Efficient LED Lighting Systems! Why not enjoy your patio/ deck area during the summer with a Mist/Cooling System by Mirage. With a Mist/ cooling system installed the temperature inside the perimeter of the system can be lowered as much as 30 degrees. Each mist/cooling system is individually designed to fit the perimeter of your patio/deck area. In addition, our professionally install Mosquito Mist System can keep your family & pets protected against dangerous mosquitoes and make your outdoor experience pest free & pleasurable! A professionally installed Sound System will bring a new atmosphere to any back yard environment. Mirage offers patio, landscape, and rock speakers for a truly personalized outdoor sound system. Each installed sound system is designed with an outdoor volume control so you won't have to go back indoors to adjust the volume. 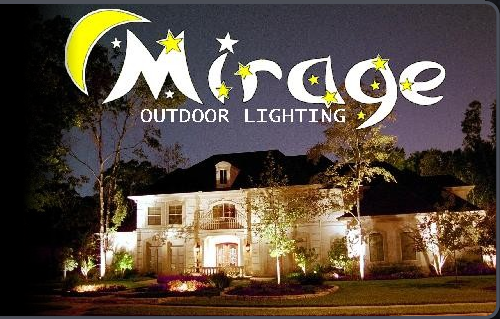 A Mirage Outdoor Lighting representative will come out to your home at your convenience. After discussing your expectations and budget, we will present a design package. If accepted, it will be scheduled for installation. The night before installation of a lighting system, one of our design representatives will bring the actual light fixtures and set them up for night viewing. At this point, you will have the choice to add, adjust or remove any light fixtures. The goal at Mirage is for the client to be absolutely satisfied with the system that is installed. 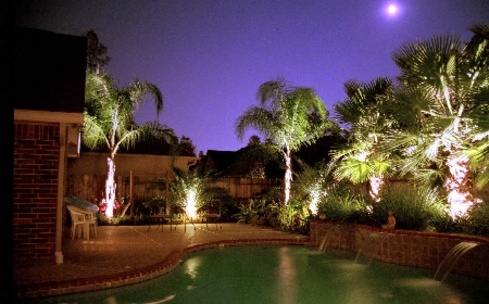 Turn your lawn & landscape into a relaxing area with quality lighting and an effective mosquito mist system from Mirage Outdoor Lighting in Houston/Cypress, Texas. We take pride in providing a full line of products that help protect and transform your yard. *Must Mention Promo Code SAVE10 At Time Of Order. Not Valid With Other Offers Or Discounts. Not Valid After Installation. Mirage Outdoor Lighting has been in business since 1997, providing quality materials and service for outdoor fixtures. We are a state licensed and fully insured electrical and pest control contractor. 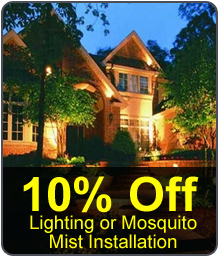 We design and install outdoor lighting and protective mosquito systems at affordable rates with multi-year part warranties and 3-year labor warranties. We also have maintenance programs to ensure the workmanship & quality of our outdoor fixtures and mosquito systems. Make your outdoor area one of your favorite places where friends and family can come together to relax, bond, and have a great time. Contact us at 281-376-3887 or (832) 534-2850 to learn more about our Lighting & Mosquito Mist Systems and other products & services. Transform your lawn & landscape into a beautiful, relaxing area with professional outdoor lighting and protect your family & pets with an effective mosquito mist system from Mirage Outdoor Lighting.